“The Rock Creek Edition name was chosen to connect to Pathfinder’s family outdoor adventure-minded target customers,” said Scott Shirley, vice president, CMM & Marketing Operations, Nissan North America, Inc. The first notable difference is on the outside, where the Rock Creek Edition features unique dark 18-inch wheels with 255/60R18 all-season tires, black mesh grille, black roof rails, black door handles and outside rearview mirrors, black front and rear fascia accents and license plate finisher, black molded overfenders and black model, grade and 4WD badges and exclusive badging on the front doors. The separation from the regular Pathfinder continues inside with two-tone fabric and more badges tied to the distinctive package. There’s high contrast stitching to call out the new interior as well as plenty of premium metallic trim pieces adding a high-end feel to the SUV. The new look isn’t just for aesthetics. The Pathfinder lives up to its name allowing with a standard trailer tow hitch and harness and splash guards so going off-road is certainly possible. Both 4WD and 2WD Pathfinder models feature best-in-class 6,000-pound towing capability, Nissan notes. All 2019 Pathfinder models are equipped with a 284-horsepower 3.5-liter V6 with Direct Injection Gasoline system and Xtronic transmission. With a torque rating of 259 lb-ft the standard maximum towing capacity is best-in-class, giving owners the ability to tow two-axle recreational trailers, whether for watercraft, flatbeds or campers. Two additional options are available with the Rock Creek Edition. The new SV Rock Creek Edition Technology Package features a MSRP of $980 and includes NissanConnect with Navigation and Services, SiriusXM Traffic, NissanConnect Services powered by SiriusXM (SiriusXM subscription required, sold separately), heated cloth front seats, heated steering wheel and heated outside rearview mirrors. All 2019 Pathfinder models also include standard Automatic Emergency Braking (AEB) and Nissan’s innovative Rear Door Alert (RDA) system, which can help remind customers of items that may be forgotten in the rear seat. It is offered in two-wheel drive and four-wheel drive configurations and a choice of four well-equipped grade levels: S, SV, SL and Platinum. 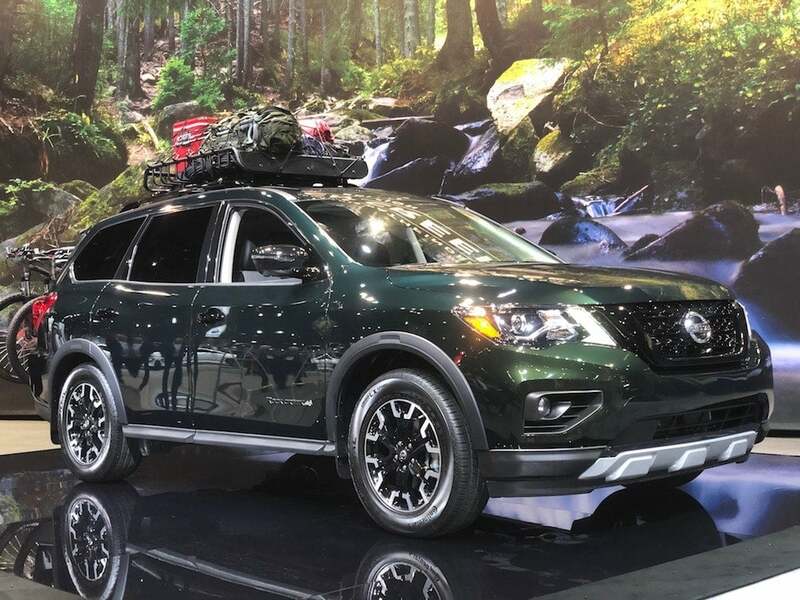 This entry was posted on Tuesday, February 5th, 2019 at and is filed under Auto Shows, Business, Chicago, Executives, Markets, Nissan, Personalities, SUVs, Sales, Sales, Trends, U.S./North America. You can follow any responses to this entry through the RSS 2.0 feed. Both comments and pings are currently closed.